Recently I had the opportunity to speak in Montevideo, Uruguay and Buenos Aires, Argentina. 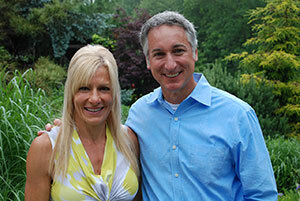 I was fortunate to also be able to visit several gardens there as well as tour Machu Picchu in Peru. I want to thank my hosts Pilar de Arteaga de Pereira, who worked diligently with me for 2 years to arrange this lecture, and her fellow members of the Garden Clubs of Uruguay as well as Sonia Blaquier and the members of the Horticulture Society of Argentina. 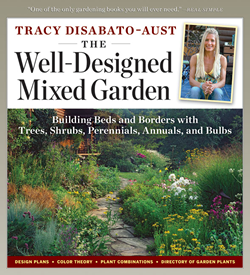 It was a great honor to speak in both countries to such keen groups of gardeners about mixed garden design and color theory from my book The Well-Designed Mixed Garden. Also what a chance in a lifetime for my husband Jim and I to spend time in our hosts homes and gardens and get to know firsthand the life and culture of these kind, warm and generous people. 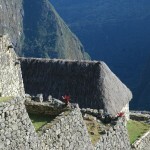 Machu Picchu is such a sacred, majestic place that words can’t even describe its beauty and impact. Enjoy a few of my images and note the uncanny connections between the design elements of these ancient ruins and the design elements found in S. American gardens today. 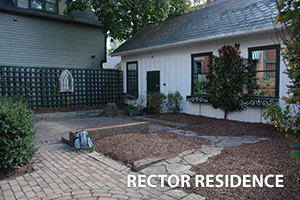 Design Principles of Order (Balance & Mass Collection), Unity (Dominance, Repetition & Interconnection) and Rhythm (Repetition, Alternation, & Gradation) are prevalent in gardens and ruins. Markets and Farming: Epitome of locally grown—everything is used from all parts of plants, to Llama fiber and dung, for dyes, weaving, compost and fuel etc. Crops include numerous beans, potatoes, and corn. 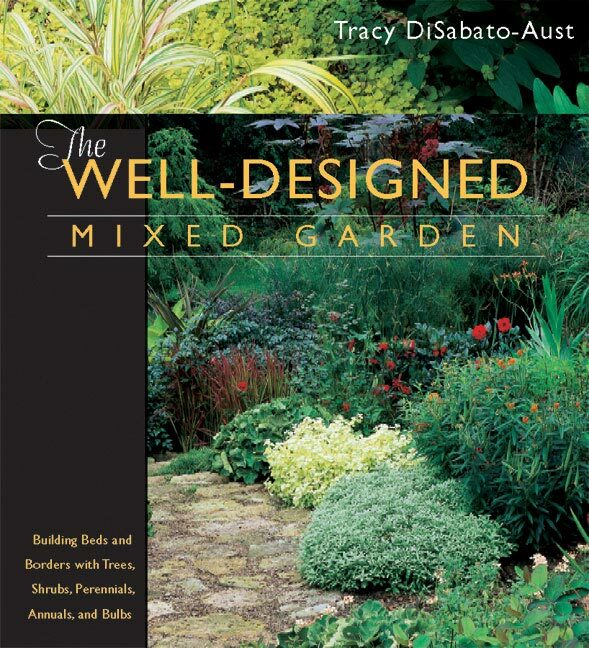 Comments Off on The Well-Designed Mixed Garden Now Available in paperback for a great low price!! My garden, Hiddenhaven, functions not only as a constant source of inspiration and enjoyment but it is the living laboratory used to test various cultural techniques as well as aesthetic qualities of plants. Over the years this information has been used as a basis for my work as an international writer, speaker and designer. 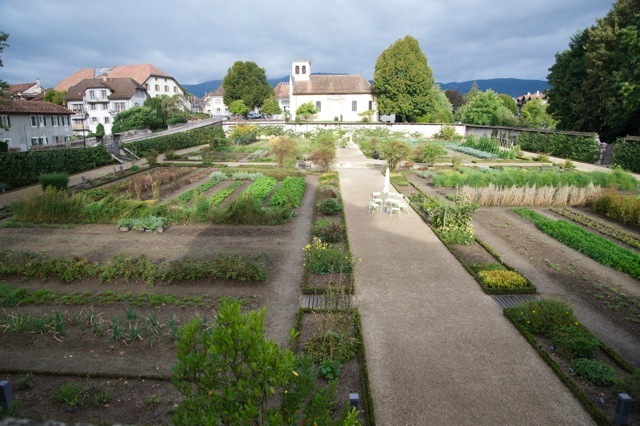 It’s a garden whose primary function is to educate. 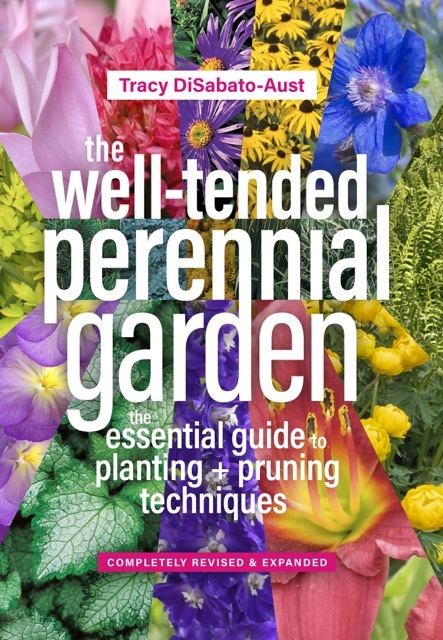 For example all of the perennial pruning strategies that are present in my book The Well-Tended Perennial Garden were carried out in the gardens. I did evaluative research studying the flowering times, heights, and quality of the floral display of pruned plants compared to unpruned plants. Other maintenance information in the book is also garnered from the gardens. 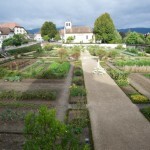 Such as the effectiveness of various organic soil amendments, staking and division techniques, as well as information on pests and disease. The gardens are cared for with environmentally friendly techniques and are not only occupied by humans but numerous cats, dogs and chickens! Trees, shrubs, perennials, annuals and bulbs are also evaluated at Hiddenhaven for their aesthetic effectiveness in the garden. 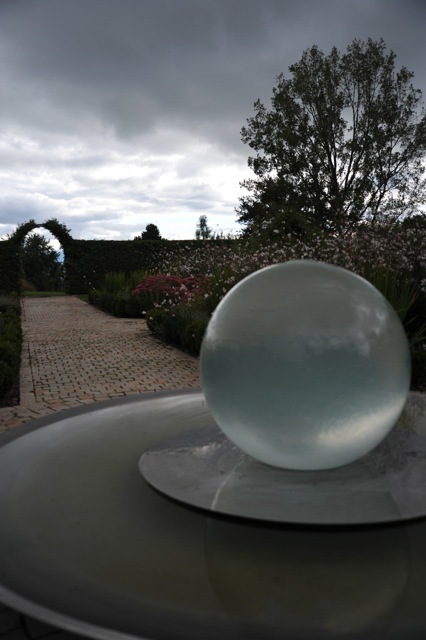 Color, texture, form, scale and proportion, and effects of light are just a few of the elements observed and used as a basis for my design work as well as my book The Well-Designed Mixed Garden. At just about any time and any day the gardens need to be poised for photography for publication in books or magazines or for speeches. The information in both books has been shared for many years in lectures with audiences from the across the US to S. America, New Zealand, Australia and England. 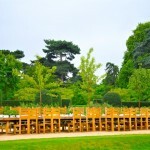 In England I’ve spoke several times at Wisley, The English Gardening School, Brookhill Garden Courses, as well as Kew, Oxford Botanic Garden and for Specialty Plants. 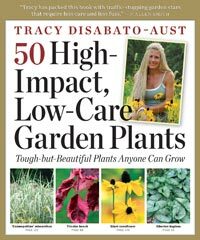 Most recently I completed a new book titled, 50 High-Impact, Low-Care Garden Plants. All of these high impact low care selections grow in the gardens and I’ll discuss many of them in the following text. 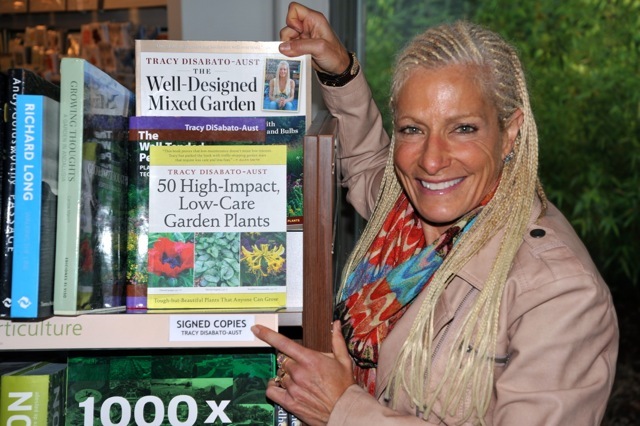 The book was inspired by my desire to have dynamic highly ornamental plants that will be low maintenance due to my active lifestyle and the need I saw among other gardeners with hectic lives. Between family, running a business, and extensive training and racing in triathlons at the national and world level, I don’t have the time or the patience to devote to difficult divas! Plants must earn their keep if they are going to be allowed to stay in the gardens. 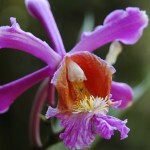 They need to be long-lived, tolerant of cold, heat, and the humidity of the region. They shouldn’t require frequent pruning or division, staking, heavy feeding, and they need to be disease, insect and drought resistant, non-invasive and deer proof. 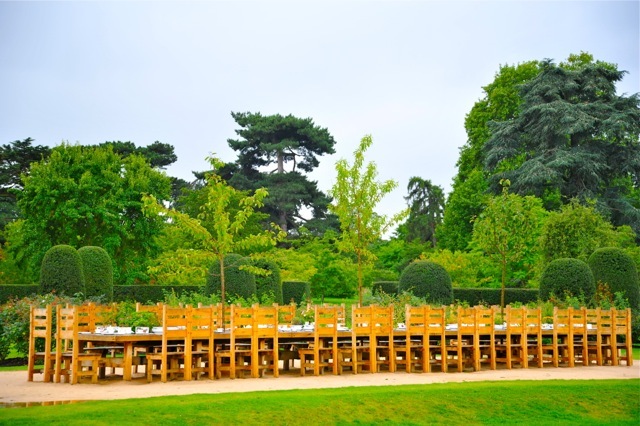 Due to my bachelor’s and master’s degrees in horticulture and my early work in gardens such as the Kalmthout Arboretum in Belgium and Knighthayes Court in Devon, the garden’s design is plant driven. They are literally gardener’s gardens. Hiddenhaven is located in central Ohio north of Columbus, the capital of the state. It is in the USDA hardiness zone 5a (average minimum temperature of -20 F (-28.8 C), and heat zone 5 which has 30 to 45 days above 86 F (30 C). 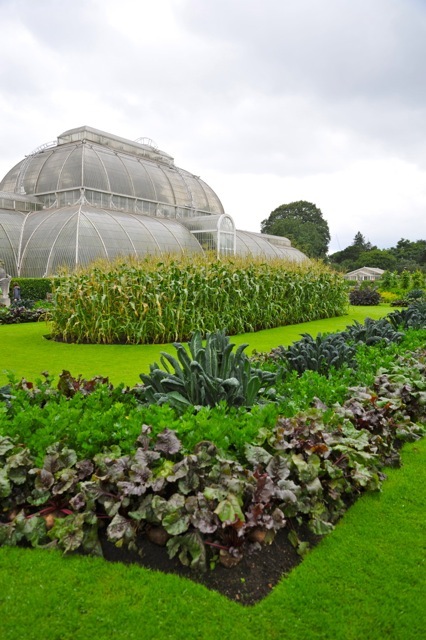 The gardens receive an average maximum precipitation of 36 inches (91.44 cm) per year. 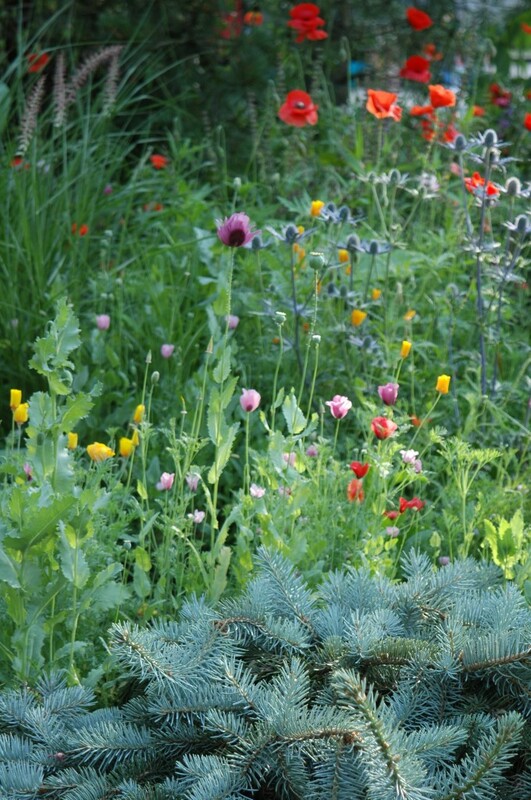 We have difficulty with heavy clay soil and have numerous pests including fourlined plant bug, Japanese beetle, bag worm, pine sawfly and deer. I’ve been asked on numerous occasions “can you actually garden there?” There are numerous states in the Midwest with very similar conditions. And although there are many areas in the US and England where the climate is more suitable to gardening we have embraced our conditions to create artistic, beautiful gardens in spite of it all! 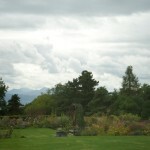 The gardens are comprised of about 8,000 ft. sq. of mixed borders which sit one-third of a mile off the road in the middle of 35 acres of fields, wetland and woodland carved with paths for hiking and cross country skiing. It was originally farmland and is still neighbored by horse and dairy farms. The gardens started as tradition herbaceous borders inspired by the British borders I had visited and worked in as a student. They contained give-away plants that had survived my master’s research on overwintering and cold hardiness of perennials. 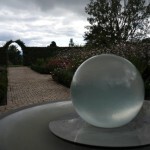 Many deletions and additions have occurred throughout the years and the gardens are always changing. I’ve been fortunate to have talented women who have helped me in the gardens once a week to gain experience so they can then go on to form their own design and maintenance businesses. 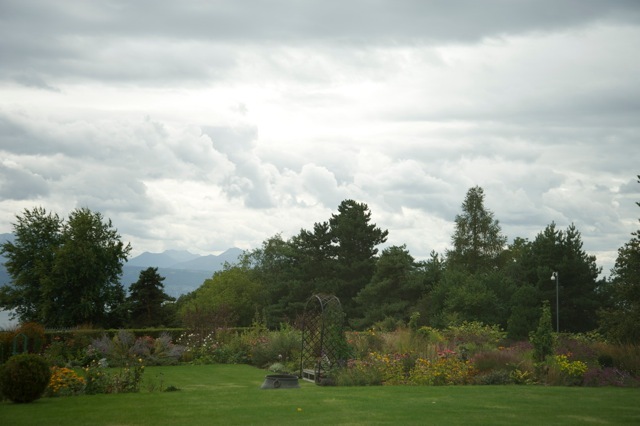 To create a sense of place in accordance with our location and log home, the gardens are designed in an informal style with native and non-native plants creating somewhat of a stylized meadow in many of the areas. Here plants are allowed to seed and colonize. Large drifts of gateway Joe Pye weed (Eupatorium maculatum ‘Gateway’), summer sun heliopsis (Heliopsis helianthoides ‘Summer Sun’), Korean angelica (Angelica gigas), purple coneflower (Echinacea purpurea), and various ornamental grasses such as bottle-brush grass (Elymus hystrix), wild-oat (Chasmanthium latifolium), cosmopolitan maiden grass (Miscanthus sinensis var. condensatus ‘Cosmopolitan’) , and princess fountain grass (Pennisetum purpureum ‘Princess’) mingle to create an explosive display within an envelope of surrounding woods . In another area of the gardens rattlesnake master (Eryngium yuccifolium), look again phlox (Phlox paniculata ‘Look Again’), Rehbraun switchgrass (Panicum virgatum ‘Rehbraun’), tall purple moor grass (Molinia caerulea ssp. arundinacea ‘Skyracer’) and black-eyed Susan (Rudbeckia fulgida var. speciosa) create another meadow-like feel. Due to my extensive travel abroad the overall style of the garden is extremely eclectic which also conveys my rather obsessive plant and art collecting tendencies. 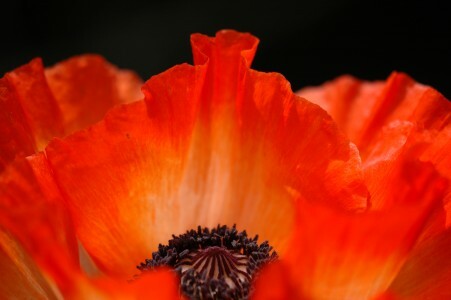 Color is key throughout the gardens. 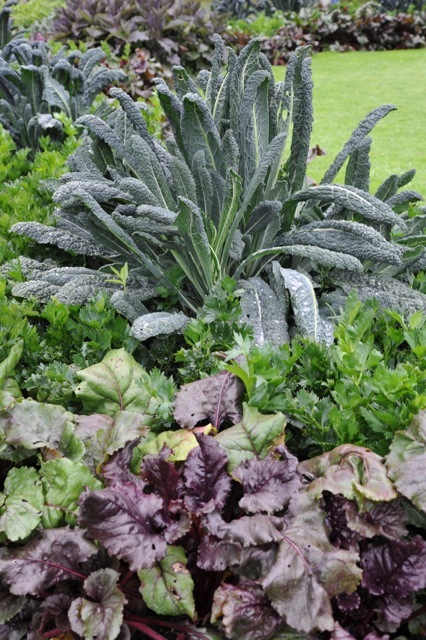 Foliage color, texture and form are currently featured and unusual plants grow alongside more common plants used in uncommon ways. Unusual annuals add needed punch among the hardy plants- Cordyline fruticosa ‘Dr. 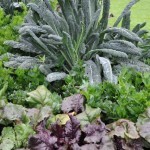 Brown’, inky pink coleus (Solenostemon ‘Inky Pink’), redbor kale (Brassica olereacea ‘Redbor’),magilla perilla (Perilla frutescens ‘Magilla’) and honey bush (Melianthus major) are few of the favorites. 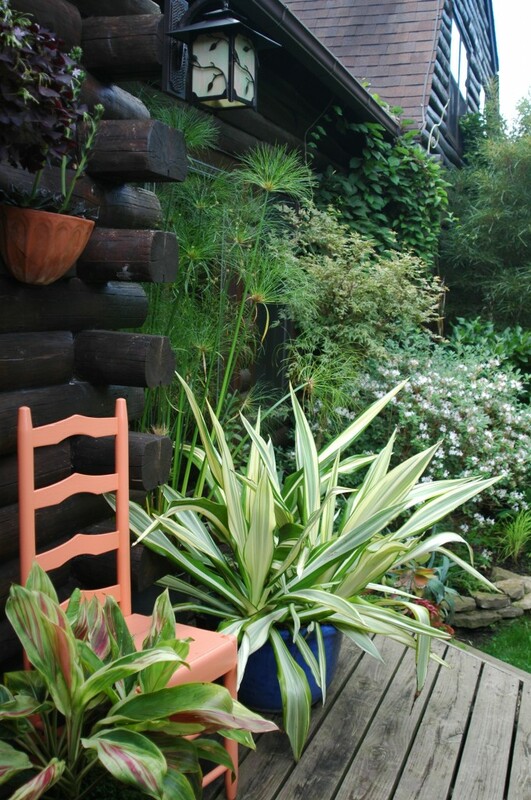 Also containers full of drought loving plants like agaves, manfreda, furcraea and kalanchoe thyrsiflora spend the summer on the back porch as a respite from winter in the conservatory. Many hydrangea grace the gardens due to their high impact and ease of care. One vignette features complementary colors with Hydrangea macrophylla ‘Penny Mac’ and brilliant autumn fern (Dryopteris erythrosora ‘Brilliant’). I use numerous dwarf and intermediate growing conifers such as dwarf corkbark fir (Abies lasiocarpa var. arizonica ‘Compacta’), and skylands spruce (Picea orientalis ‘Skylands’) which provide much needed color and form during our long winters. The front border’s split complementary colors are based on the colors of Cerinthe major ‘Purpurascens’ including violets, blues, blue- greens, and yellows in the spring and they heat up in the summer with Bowles’ golden sedge (Carex elata ‘Aurea’) , dragon’s eye pine (Pinus densiflora ‘Oculus-draconis’), Lilium lancifolium var. splendens, and Lilium henryi, blue fortune agastache (Agastache ‘Blue Fortune’), Issai purple beautyberry (Callicarpa dichotoma ‘Issai’), spiny bear’s breeches (Acanthus spinosus), and plumbago (Ceratostigma plumbaginoides). A large vine of Graham Thomas honeysuckle grows on the front of the house up a custom made iron trellis whose style is repeated in an adjacent porch railing and arbor in the back garden. The scent of the honeysuckle permeates the warm summer nights and stirs emotion. A customized chicken coop that houses 10 different “designer breeds” which lay blue, turquoise and brown eggs reflects the properties heritage. But it sports modern bright colors of yellow, cobalt blue and red which repeat through the garden in benches, pots, glass sculptures and trellises. These colors are also repeated in our home, on our porches and in the conservatory attached to our home to create unification of all the spaces. 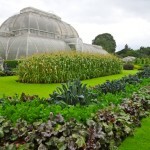 I feel that I and my family have grown along with the gardens. After years of working in cooperation with it in an attempt to make it into the way I’d like it and accepting that it will also teach me the way it’s going to be I’ll have to say that I’m content with it. And I’m extremely appreciative of all that it has given to me, both in my career as well as personal life. I think that’s a good place to be. 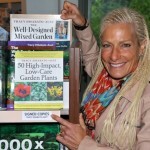 What’s next: For the next year I’ll tour promoting my new book and high impact low care plants. I’m taking on design commissions again and currently I’m working on the details to speak in Uruguay and Argentina in September 2009. Many spring flowering perennials such as Iberis, Arabis, Aubrietia, Phlox subulata, and Dianthus gratianopolitanus should be cut back by one-half after flowering to maintain a dense mound and prevent an unsightly hole in the center of the clump. Multi-branched summer and autumn flowering plants such as Heliopsis, Echinacea, Phlox paniculata, and asters can be cut back by one-half prior to flowering when the plants are 16-24 inches (40.64-60.96 centimeters) in height to delay flowering (in an attempt to time bloom for a special event or combination), and reduce plant height to eliminate staking. Flowering can be delayed by 10-14 days in most cases. Mounded perennials like Baptisia and Amsonia respond to being sheared by one-third after flowering to form an attractive full shrub-like plant rather than a leggy irregular form. Plants that may have had pests or disease during the season should be pruned for the winter and debris should be removed from the gardens to prevent further spread of the pest. Plants that are slightly tender for the area should not be pruned for the winter as they may overwinter more successfully if protected by the foliage. Prune in the spring after all danger of cold has passed. Select the right tool for the job. By-pass pruners (secateurs), never-dull or bonsai/grape shears, as well as hedge shears are used for various pruning jobs in the gardens throughout the year. Learn how to effectively paint your garden in plants, the first of our two-part series of using color in the garden.